Frequently, turns are not explicitly written on dance diagrams. In those cases, a change from forward to back edges (or the opposite) must be noted by the reader, as well as what are the initial and final edges. Dance notes may be more explicit, particularly if turns are required to be closed or open, swung, or other specific instructions. 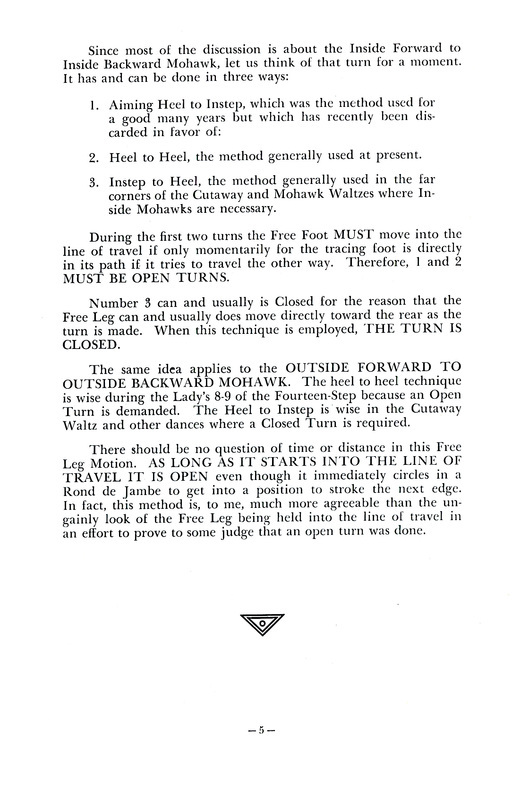 The names of the turns have been in use from at least 1892, if not earlier, as described in "Figure-skating, simple and combined" by Montagu Sneade Monier-Williams et al. for the Wimbleton [ice] Skating Club, published by Macmillan & Co., New York 1892. Two Foot Turn: The free foot is used for the new edge. 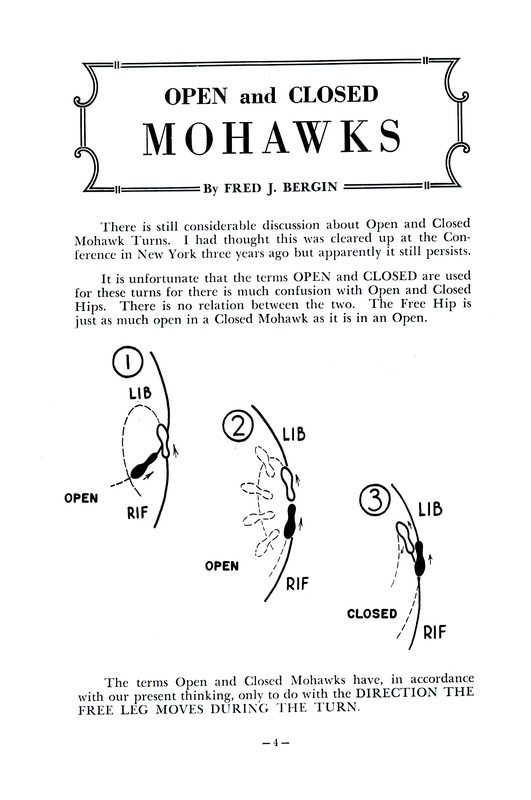 For example; from a right inside forward edge (RIF) to a left inside back edge (LIB) - a Mohawk. Choctaws, utilizing different edges - inside to outside or outside to inside. Turns are made in the 'turned out' heel-toward-heel position, which determines the direction the body is turned. Toe-to-toe, 'reverse Mohawks' or 'Inverted Mohawks' were long discontinued for skater safety reasons. Although recently are seemingly being reprised. This anecdote was researched and related to this author by a native american, Mike Soto. In the early 1500's, skaters in England, upon seeing dances performed, separately, by members of the Mohawk and Choctaw tribes from the Northeast part of the recently 'discovered' American continent, named these skating turns after the steps performed differently by the different tribes. One Foot Turn: The employed foot is used for the new edge. For example; from a left outside forward edge (LOF) to a left inside back edge (LIB) - a 3-Turn. On quad roller skates, this is accomplished by initiating a sharp cusp, then sliding the trailing wheels, not hopping them, around to the new edge. Although these turns are used in dance skating, a whole field of endeavor is the 'School Figures' or 'Moves in the Field' Achievement tests and competitions. They, and 'Loop' figures, were formerly 'Compulsory' figures, a part of singles free style skating. More info is at US Figure Skating (ice) and USA Roller Sports 'Figure Technical Manual'. 3-Turn, utilizes opposite edges - inside to outside or outside to inside - turning 'into' the initial edge - to remain on the same curve. 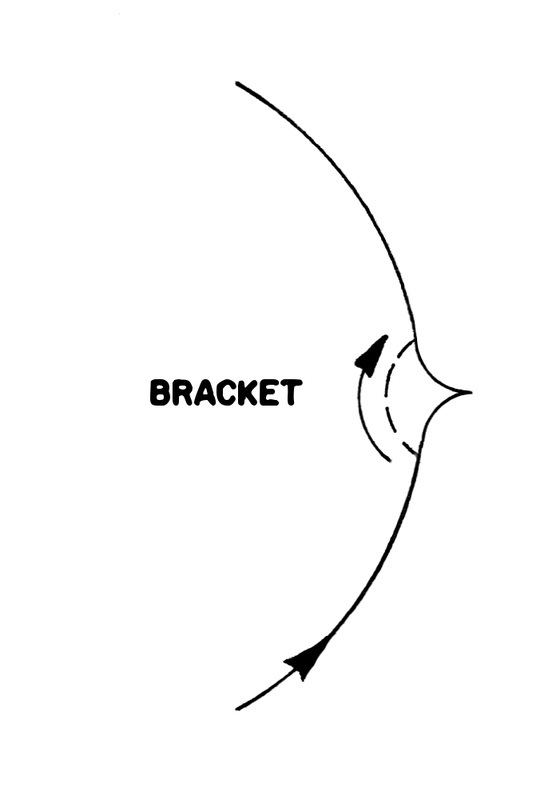 Bracket, utilizes opposite edges - inside to outside or outside to inside - turning 'away from' the initial edge - to remain on the same curve. 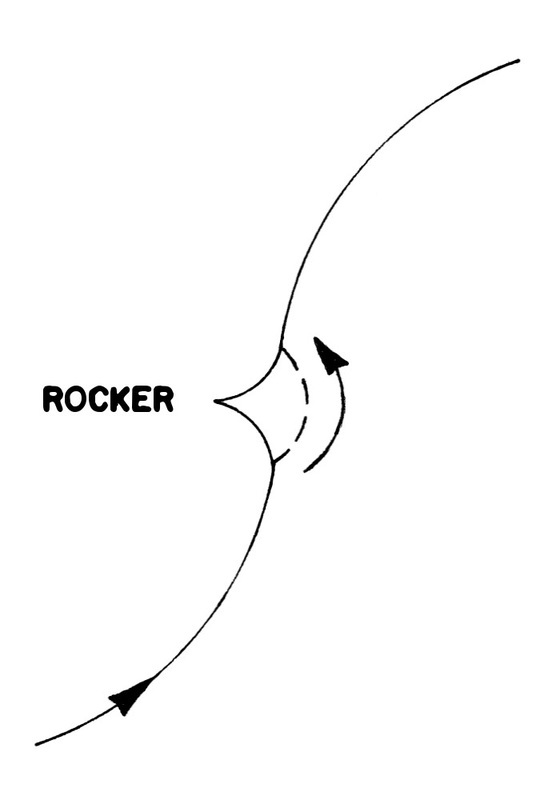 Rocker, utilizes the same edges - inside to inside or outside to outside - turning 'into' the initial edge - to change direction of the curve. 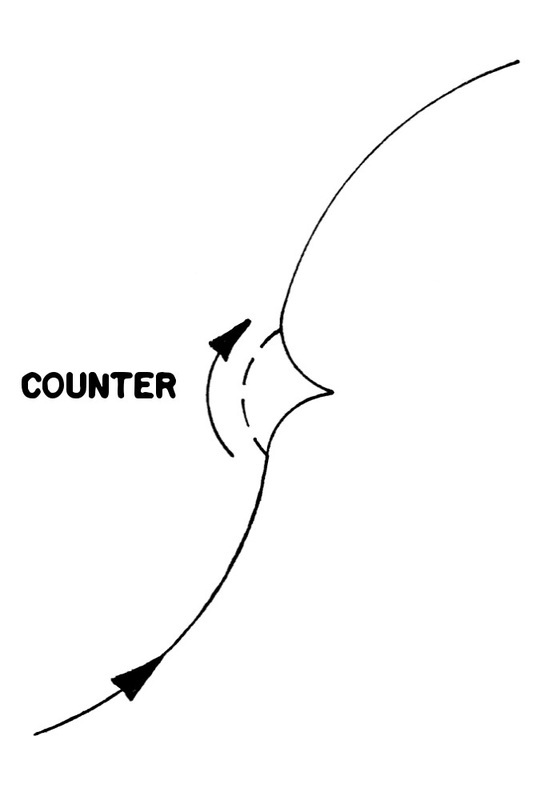 Counter, utilizes the same edges - inside to inside or outside to outside - turning 'away from' the initial edge - to change direction of the curve.